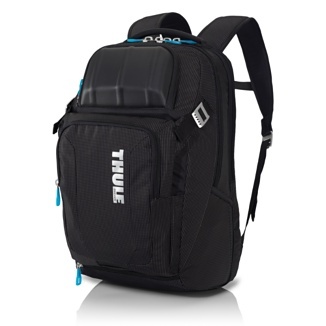 The Thule Crossover Backpack is elegantly constructed with lots of storage and a crush proof compartment. The backpack weighs 2.75 pounds which may be the only drawback for daily use. The $129.95 price is indicative of the quality of construction which is consistent with Thule products. Thule is marketing this backpack for Apple’s 17 inch MacBook Pro and iOS devices. There is an elevated laptop compartment perfectly designed for the MacBook Pro, a sleeve for the iPad, and plush lined pockets for iPod or mobile phone storage. The lockable crush proof SafeZone compartment can be used to store fragile gear like sunglasses. The main compartment is roomy enough for books and bulky items. There is a Shove-it Pocket that provides external storage that is deep enough for a newspaper and Thule claims could accommodate a jacket. In my opinion, a windbreaker may fit but a jacket or sweater would be a tight fit. Other features of the backpack include water resistant nylon fabric with padded shoulder straps and grab handle, a bottom zippered pocket for additional storage of small accessories, a front storage compartment for easy access items, and a side external pocket that can stretch to fit a water bottle. After using this backpack for the last couple of months, I found the 2.75 pounds adds too much weight with the 17 inch MacBook Pro and other gear. Without the laptop, I could comfortably carry my normal gear of iPad, iPhone, power adapters, and a school book or two. I’m not sure I should consider the weight an issue since no matter what laptop case I use the weight of the 17 inch MacBook Pro will always be an issue. The shoulder straps were a bit too rigid for me but I rarely use that feature since I prefer using the grab handle. Users with larger hands may find the narrow grab handles uncomfortable. With the added weigh of the laptop both the shoulder and grab handles were uncomfortable. The $129.95 price for the Thule Crossover Backpack is worth it for the quality construction and when considering the cost of the gear it is capable of protecting. I love the backpack and plan to use it to transport my next much smaller 13 or 15 inch MacBook Pro. If you’re looking for quality construction with lots of highly adaptable storage, this is the backpack to purchase.